Le Grenier which seems to date back to the 1200's provides both peaceful accommodation and breathtaking views over the valley, fields and forest. Cheviré Le Rouge is unspoilt by commercial development, but big enough to supply hot croissants for breakfast, fresh bread for lunch and patisseries for dinner. St Barthelemy D Anjou. Also well worth a visit! "Le Grenier is everything we expected. We have thoroughly enjoyed our 2 weeks in your lovely French home. You have thought of everything to make your guests feel welcome. Thanks! "we have stayed at Le Grenier in the past and said we would return and here we are. Thank you for allowing us to stay in your lovely French house, it's delightful. Very homely and welcoming unlike many Gites we've stayed in previously. Yes, we will return again." "we stayed at Le Grenier in June 2015 and had a very enjoyable holiday. Le Grenier is delightful...all we could have hoped for. It's an old French house that has been tastefully restored. Graham and Kay the owners have managed to keep all of its French rural charm". "all 6 of us throughly enjoyed our second return visit to Le Grenier and for sure will book again. A lovely house in rural France with tons of charm. Really enjoy having French doors out onto the balcony and veranda....Had dinner most evenings sat up there....just perfect". "this wonderful house in the Loire is superbly positioned for visiting this region...We will most certainly be back and would highly recommend Le Grenier to our friends....or perhaps we should keep it to ourselves"
"our third visit to Le Grenier and have enjoyed this lovely house yet again. It's relaxing, well appointed with all the home from home items we all expect....and is in a superb location for visiting the many delights of the Loire Valley. No doult we will be back again"! "Perfect a real home from home. Stunning views. We ate most of our meals up on the veranda with those stunning views. Many an evening was enjoyed on the veranda...in fact we ate most of our meals up there....Stunning!. We will most certainly be re-booking next year"
"A beautifully restored home to a very high standard. Congratulations, we would be delighted to return. The facilities and efficiency of service are a credit to you. A truly professionally run home from home. We hope to meet you all personally someday and look forward to another possible visit". "Le Grenier is a credit to the owners who have added all those lovely homely touches. 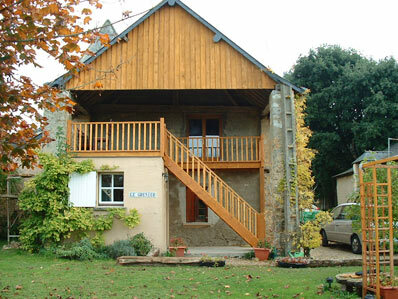 Many holiday gites are basic and uncomfortable....this is certainly not the case with Le Grenier. We liked being able to walk to the local boulangerie for our bread and croisants each morning. Thank you for letting us stay in your lovely home".